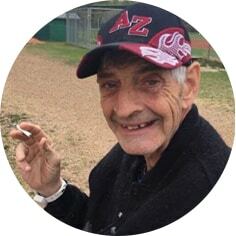 Gordon “Gordie” Larry Allan, aged 64 years of Moose Jaw, SK passed away on Wednesday, March 13th, 2019 at Providence Place. Gordon was born to William and Josephine Allan on September 28th, 1954 in Tisdale, SK. He grew up on a farm north east of Tisdale. Gordon took his schooling in Tisdale and went on to work at a few places in Tisdale. He called Moose Jaw his home for a number of years. He was predeceased by his brothers, Dwayne (1964) and William (1998); father, William (2006); mother, Josephine (2008); sister, Joan (2009); nephew, Dustin (2006); sister-in-law, Kathy (2018); and niece, Stacey (2017). Gordon is survived by his sister, Fay (Fred) Teale; brother, Rick; sister, Marilyn (Dwayne) Lee; brother, Lessel (Angie Phillips); brother-in-law, Edward Balion; as well as several nieces and nephews. The Memorial Service will be held on Saturday, March 23rd, 2019 at 1:30 p.m. in Moose Jaw Funeral Home with Dave Foley officiating. Burial will take place at a later date at Tisdale, SK. Arrangements are entrusted to Moose Jaw Funeral Home, 268 Mulberry Lane. James Murdock, Funeral Director 306-693-4550. How sad it is when our love ones die. The reason for this bad news is mention in the scriptures recorded in 1Corinthians 15: 21 – 26. May this news bring comfort to the family, also accept our sympathy. So sad to hear that Gordie has passed away. We only knew Gordie for a very short time as the best ever roommate for our brother-in-law at Extendicare ! Always greeted us with that huge smile and entertained us with country music. We feel very lucky to have met this special fellow!